Antiques challenge. Catherine Southon uncovers a pair of vintage glove puppets. But will they give her a helping hand at the Edinburgh auction? -It's the nation's favourite antique experts. Welcome to a bracing Caledonian morn with Catherine Southon and Paul Laidlaw. I trust you've had your porridge this morning. You'll be set up for the day. they're now deep in the Scottish Borders. Look at that. People say, "Oh, the Highlands!" But it's lovely round there, isn't it? which dates from an era before seatbelts were mandatory. Makes you want to get out your easel and your paint brush. -Well, we're glad you like it. -I do, I do. And it's so green. trademark militaria, profitably exploring his feminine side instead. Twee little tea set which did you proud. You bought them beaded bags. For goodness sake! Come on, they were dirt cheap, weren't they? They were, they were. Which, in truth, was the appeal! -scaled the moral high ground. With a similarly shrewd purchase to her name. Yeah, we're in the rag trade now! Ha-ha! Catherine has so far shrunk her £200 stake to £169.96. While Paul, who began with the same sum, has £372.76 to spend today. -Oh, you've got so much money, you don't know what to do with it. -if he could borrow some money from me. Our journey started out in Portrush, County Antrim. Scotland and will finish several hundred miles later in Aberdeen. north towards an auction in Edinburgh. with its magnificent ruined abbey, is quite a spot. having dropped Catherine off a little earlier. Hello, there. Is it Susan? To see you, nice! Lovely shop, too. Fabulous stuff. Very nice indeed. But where are the bargains? anyone with an eye can do that. It's to find the object with the profit left in it. and I'm going to see sophisticated - environment. My hope levels are down at one little bar. Keep digging! Dog's life, eh? A late 20th century rod and lamp or wine table. What on earth is Laidlow up to? Forget the table. Look at the top. the tiles in the top may date to the 1670s. Actually, I think they're a bit earlier than that. Come closer. losses to the glaze. We get all of that. because here we have a splendid pair of 17th-century musketeers. floppy-brimmed hat with bandoliers draped round his body. with a measure of powder. were termed The 12 Apostles. marching down the high street, parading on a Sunday afternoon. Time travel, I love it! I like the juxtaposition of the 17th century with the 20th century. Yeah, that said, I'd really rather hack them out! Best buy it first, Paul. The ticket price is £65. Susan, I love your wee wine table. Yes, it's lovely, but the tiles especially. Aren't they just? Is there much margin in that? -Is there slack in that price? -Are you going to hit me with it? -Dare I push you any further? You can push me a little but not very much. -I need a three at the beginning of that price. -Give me the bottom line. -45 would be the bottom line. -Thank you, that's all I need to know. If you would sell that to me for £40, that fiver will seal the deal. and a lot quicker than it seemed it might be, too. Just in time for elevenses, eh? It's my lucky day, is it not? -When in Rome and all that! let's see where Catherine has got to. -Hi, there, it's nice to meet you. You are very lucky to work somewhere like here. it belonged to the wealthy Balfour family. but where does plant collecting come from? that you have seen growing in the world in various parts of the world. of the rich has been around for hundreds of years. But it was once highly dangerous. in search of exotic plants. What fun! but this part of China in the south-west was relatively unexplored. you were looking for fairly close at hand. Obviously, all you had to do was get there. one of the most successful plant collectors of all time. But history could have turned out very differently. So, how successful was the first expedition? It started off fairly quietly, actually. Forrest arrived too late in the season to collect any plants. -But it was OK. He spent the time usefully here. working out where the best place to collect plants would be. but this is where it all starts to go wrong for Forrest. It's been illustrated quite nicely with this map that Forrest drew himself. -It must have been terrifying. -Oh, is that his escape route? It is his escape route, indeed. Unfortunately, they are not able to evade these men for long. The attack eventually does happen and it is every man for himself. Completely different, yes, he has been starved, hunted. He looks a lot thinner. and returns back to Edinburgh in 1907 with a massive haul of plants. he goes on to do another six expeditions out to China. in scientific history, his seventh trip in 1932 was to be his last. so he never made it back to Edinburgh. and immaculate record keeping, Forrest's plant collecting legacy lives on. -the different specimens that he was picking up? -There's about 25 volumes of them that we have. And they're still used today. That's the nice thing about these archives. and have a look at this plant actually growing here now. That's incredibly special, isn't it? -So what is this particular plant? the wife of a friend of George Forrest's as well. of the plants he brought home would become threatened back in Yunnan. But in the herbaria he helped to create, biodiversity is in good hands. and plant it in the botanic garden there. And we can also make people more aware about their biodiversity. manufacturing luxurious cashmere and merino products. ..once he's polished off that pie, that is. -Hello there. Is it Morris? -Is it a mill we're in? up to about ten years ago. Recently transformed into this huge antiques emporium. Containing an awful lot of fine furniture. Give it a rub, eh? 18th century gate leg table. Nice little size. It's £245. I think even our hard-hearted expert is tempted. Face it, Paul, those aren't for you. This is the densest room in the building for smalls. I keep looking at this stick stand here. There's good workmanship there. Don't write this off as the work of some 1960s blacksmith. I think there's real quality in terms of design and execution here. What makes it for me are these scrolls. And see the way that scroll wraps itself around the upright member. But it's very black and that's not everyone's cup of tea. It's also got some problems. It's a wee bit drunk. because this replacement bowl is too long. Ticket price £75. I'll tell you what. I think his mojo is working again. Must be the pie. Time to get a price from Morris. -I'm a long way off. -I'm a 40 quid job on that. -Can I let you know? -Absolutely. But I'm seriously interested. Sounds like Morris may be biddable. Anything else? with that little string inlay there. Wrong! It's all tin plate. and lozenges. "The world's winter sweetmeats." Get in! a mixture of laudanum, cannabis and chloroform. Advertising packaging, vintage material, sells. box in the world but it's not the most dreary either. It taps into an iconic brand. Something to ask about, I'd imagine. Only issue I could find was the top drawer is snagged. I don't think that is a difficult fix. But you know what it might be? It might be a lever for me to get this at the right price. Morris is still considering Paul's proposal of £40 for the stick stand. -There's a tin plate chest of drawers, it's a Victory V's thing. -It's a bit buckled. I can't get top drawer open. 10 or 20 quid. -£50 the two. We've got a deal. -Pleasure, Morris. Sweet as a nut. -I'll give you some money. No sign of Paul's little fortune going to his head just yet, is there? Ah, now, here's Catherine, hands in her pockets. That cheeky Laidlaw is already here. Yep, and he's looking suitably smug. -Well, well, well. What are you doing sitting here? -Uh... I've bought a few things. -What have you been doing? Where have you been? -I've been on an adventure. -You'll love it by the way. Huge. Nothing left of course. ignoring the furniture and letting Morris be her guide. -That is nice quality, isn't it? -With Mount Fuji in the background. So fresh it hasn't got a ticket on it yet. -20th century, I would say. -I would think so, yeah. So you would have put your cigarettes all in here. -Sometimes people use these today as cardholders or something like that. -So this is all lacquered here. -What's the best on that then, Morris? -lower or should I look for something else. -Would it be really cheeky to say 35? -I'll take your £35 for that. -So we've got a deal on one thing. Not a lot of shaking on just yet though. Anything else? That's got a good look to it. I like that. -How old is this one do you think? I've got another one upstairs, another pond yacht. -I think it's upstairs anyway. -Is it a good one? Meanwhile there's a pair of decanters to take a peek at. -I've only got £30 on the pair. -They look pretty good, don't they? -But they don't excite me like the case did. 15 quid. That's £7.50 each. That is cheap. Still no deal though. -Now for his other yacht. -Quite a nice thing actually. -That is a proper pond yacht. What can that really go for at auction? What can I see that making? -No, it won't make as much as that. I think it's a bit tatty. -Knock me down a lot. Honestly I'd probably see that at £40. at the moment because I'm... I've got a lot to think about. I'm beginning to lose track of the contents of Catherine's growing pile. How about this little tobacco jar? Victorian, cast iron. Love the shape. Octagonal shape. Nice. It's cast iron. Nothing to it, is there? Everything is there. Little brass finial. OK, are we about to witness a handshake? -There you be. Are you ready for this? I'm deciding not to go for the decanters although I like them. Then there was three items. -There was the lacquered card case. -There was the little Victorian tobacco press. There was the pond yacht. So those three together with the prices that we discussed was 80. Can I come down to 65, 70? Phew! They've both had quite a start. -Do you know what would be my dream? And it makes... Oh! Oh! Are you enjoying that? Are you enjoying that? Next day there is an "offal" lot to talk about. face lit up when I saw the finest Scotch pie emporium in Scotland. I bought haggis, white pudding... Have you had mealy pudding? -No. Don't like the sound of that. -Sounds horrible. Do you eat it? I'd really rather hack them out. ..which set him back £90, leaving just over 280 in his wallet. and a pond yacht. As you do. Hey. All for £70. Meaning she has less than 100 at her disposal. -There's nothing I'm going to make a lot of money on. That's all right then. I don't care any more. Aren't the views nice? but our next stop is in Innerleithen, Tweeddale. the only contemporary novel by Sir Walter Scott. Have a good one, you. -Thank you. Wish me luck. -Hi. Hi. Lovely to see you. -Hi, Margaret. Nice to meet you. It's a small space but it's absolutely rammed full, isn't it? You took the words right out of my mouth, Catherine. Look at that lot. -Is that silver, the golfing one or...? -I've got 35 on that one. -Are you a golfer, Margaret? No, I'm not a golfer. Quite a few are in Edinburgh though. Stamp 925 sterling so probably not English silver I wouldn't say. plus fours taking a swing. And what could you do on that, Margaret? because at 28 it might be a bit much. One little item under consideration already. Oh! They are being watched. -That's my speciality, is the dolls and the teddy bears. -It's not as good as it used to be, is it? -and want to find a doll. -They look good up there, don't they? -They're watching over you, Margaret. -They come out at night and have fun. This is turning into Toy Story. I bet those two join in. Puppets. You sell a lot of puppets, do you? -I loved Sooty and Sweep. These are the earlier ones, the '50s ones, when they came out earlier. -in that one. He has brown ears. -Do I buy the brooch? I do buy the brooch. Oh! Consulting Sooty, eh? I didn't see that coming. They're in agreement. They're fantastic. I'm tempted to buy these. -So who were these made by? Chad Valley...? It's got the label there somewhere on the side. -This one's not in bad condition. -Sometimes you get the noses repaired and they've been re-sown. -No, that's not had anything done, I don't think. No surgery then. But his mate's looking a bit worse for wear. Sooty, I think you're kind of past it a bit. -I thinks Sooty's maybe been the one that was the most cuddleable. The ticket price for the furry pair is £48. That to me doesn't even look like Sooty. Are we definitely Sooty? Erm... Well, they came together. -Where did you get them from actually? -So that's why I felt reasonably confident that they were right. Sounds like Sooty's passed the test but where are we on the deal, children? What could you really do on these? Could you do 50 for the two? Because that, I think this is mid-20th century. -But I think 25 is top whack. -and a bit of fun. -OK, then. We'll go for 50. -I'm going to shake your hand. -Hope they do well for you. I really hope they do. Yeah. I mean that face, it says, "Come on, buy me," doesn't it? Oh-ho-ho! I think we might have struck gold, don't you? Oh, yes. Scottish writer of The Thirty-Nine Steps, one of our most influential spy novels. -Yes, Paul. How very nice to meet you. some of the most exciting passages of his man on the run thriller. -..and that you would see a fugitive running. Particularly if you had a monoplane. I read it as a teenager and it is one of the best reads of my life. The Thirty-Nine Steps while recovering from an illness on the eve of World War I. He was sent to bed in August 1914 with a terrible stomach complaint. -"both the victim and the perpetrator." and she was running up and down the steps that led down to the beach. -And she ran up and she said, "Daddy, there are 39 steps." And that's supposed to be from where he got the title. -Well, the source of the story is quite good. hit, with huge numbers delivered to the troops. although too ill for active service, was to play quite a part in the war. -He becomes a Times correspondent during the war. history of the war published fortnightly in The Times. -Then he joins Earl Haig's staff. -I see. In intelligence or...? -So he ends up on active service regardless? best friend died, Buchan occupied a senior propaganda post in Whitehall. He then turned to politics and became a Member of Parliament. -because he can always see the other person's point of view. And he found it very difficult to adhere to a party line. publishing around 100 works of both fact and fiction. He's commissioned to write the Jubilee book for King George V.
the king, the king decided to send him as governor general to Canada in 1935. My word. That is some career. -You say not a successful politician but that's some achievement. can tell you, it's a somewhat free adaptation. came to him and said, "Tell me, my Lord, how are you enjoying the film?" That's the anecdote of this encounter for me. This is just beautiful. There's more sheep than anything here. It makes you feel good to be alive, doesn't it? and the village of Wiston. -There's so many mutton pies there. Paul, they're not all to eat! One last shop to share. Nicely. Right then. Elbows at dawn? Let the shop name be your guide. -How are you doing, Mark? Delightful place but it might be a bit of a squeeze. -Would you mind if I head that way? wherever you want, and I'll go with Mark. -At what point did I become the gooseberry? You've got some fantastic pieces round here. There's plenty of things hidden away. In under things. There are, aren't there? That's what I like. -Nice... This octant has seen better days, hasn't it? Missing the scale and the vernier. Still looks good though doesn't it? Looks nice. -Yeah, a nice decorative thing for the wall now. -It makes it cheaper as well. Paul however is definitely in the market. So I've just picked up a wee plastic box full of bits and bobs. That is a little Scottish brooch set with polished hard stones. One couldn't call that a lot. Society of Scotland Long Service. "Look, I'm doing my bit for the war effort." For me the most interesting little object is here. Nice little silver lapel badge. If you don't know your armorials you've got no idea. However I do recognise the device of the three cannon and the three shot. the government department that deals with munitions and supplies. None of that particularly stands out. However, show me a fistful of it and I will show you an auction lot. Ah, Paul, just the person. No, come back, come back. You know what your problem is, Catherine? It's work ethic. If you wouldn't mind getting me a coffee because I'm almost done with this crossword. I think she's done with shopping too. You've seen a mariner's sextant before. This is a variation on the theme called an octant. of a given celestial object. And thus one can determine longitude. an American having independent and equal claims to have got there first. I adore scientific instruments. However, this one is incomplete. it's an engraved scale from which one can take readings. So as far as I'm concerned it's too far gone. However... Maybe in that condition it's buyable. We'll ask the question. -Wrecked. Very much so, yes. -It's dead and gone to heaven. In your opinion what's it worth then? -Well, I have £100 on it at the moment. Are you open to offers, cheeky offers, insulting offers? -50 quid, eh? A thought for you. -I would do the whole lot for 25. So the total currently stands at £75. buy anything you have to apologise for. A very good rule of thumb. But do we spy a deal on the horizon? -on the two I will convince myself I got it for 40. -Yeah, I'm really struck now. 70 quid. -That's it. I know when the bottom line's been reached. they'll be bringing to auction. various badges, a stick stand and that octant. brooch, a pond yacht, a tobacco jar and two vintage glove puppets. She's going to make money and there are some killers in there perhaps. That stand. I'm surprised he paid so much for that. He may have a little wobble with that. Glove puppets, not my thing. "That's the rare early one that you never see," it could be a good margin in it. towards an auction on the outskirts of the capital. It doesn't feel like we're anywhere near Edinburgh. because there are the Pentland Hills and just to the north-east of those you've got Edinburgh. -My little map here, haven't I? -Am I like your little Sherpa? That's right. I can translate, I can show you the right fish and chip bars. Are you ready for a slaughtering? Listen to you. Get in there. everyone hot under the collar. commissions left on Sooty and Sweep and I think they'll make £30, £40. a small section, but I still think it will fetch in the region of £60 to £80. People will see beyond the table. They will see just the tiles, I think. As long as nobody's a mug on them. -Two bids on this, can start at £25. Who's going on at 25? 28, 30, two, five, eight, 40. You're all out in the room at 42. Anyone else going on at £42? Catherine's turn. Her Japanese cigarette case. And I can start straight in at ten bid. -Ten bid for a nice cigarette case. -It's going to do it. Come on, a bit more. A bit more. Anyone else going on at £40? That's better than my table. So now we have your box of rust. Your rusty box. I remember the sweets when I was younger. -I'm going to start this at ten bid. Ten bid, ten bid, ten bid. -Bid's with the lady at 18. -It's got life in it yet. On my right at 22. At 22. -I take it all back about a rusty box. Definitely V for victory. Now for Catherine's tobacco jar. -A bit of jealousy there? £20 for this. 20, £10. -Everywhere. I don't like the sound of that. -28. The lady standing at the back at 28. Anyone else going on at £28? I may have to lie down somewhere. Mr Laidlaw, are you jealous of that purchase? Go on, admit it. Go on. He picked this stick stand up pretty cheaply too. They didn't miss it. They walked round. ..Eight, 30, two, five, eight, 38. Bid's on the right at 38. -People appreciated it like you did. It's just going to wash its face. It's flat, this. For me, it's flat. An unusual experience for our Paul. -Bring it on. What's next for you? They're supposed to be quite keen on golf round here. I have two bids on this and we start at 15 bid. 30, 30, standing right at the back at 30.
Who am I missing for golfing interest? At £30. I think any golfer would be pleased with that. This could be divisive, the octant Catherine rejected. and no more, as my other lots have, I'm doomed. Anyone else going on? 38. ..80, £80. You're all out in the room. -Make no mistake, selling on commission. The best profit of the day. Now, "Izzy wizzy, let's get busy." Did you not have a Sooty and Sweep? -Are you a bit old for that? -How very dare you, madam? Paul reverts to type with his next lot. Very interesting collection of military and other badges. -Not enough. You've done it. -..30. anyone else going on at 30? -You've beat me and you've got a lot to go. Never nice to see a grown man cry. I think maybe we should come back here. Yes, she's cruising towards victory today. £50 for it. 50, 30? She's stabbing me in the heart. -..35, 38, 40, £40. On my left at £40. -No-one else, I would hope. No losses and some tidy profits leaves Catherine set fair. Oh-ho-ho-ho! Let's go and party. I don't feel in a party mood, funnily enough. I don't know what it is. Come on, don't be a party pooper. We could do the conga. has £195.92 to spend next time. -There's only one way I'm going now and that is up. You've beaten me by a fiver and you've taken off like a rocket! -Listen. Hare and tortoise, remember that. 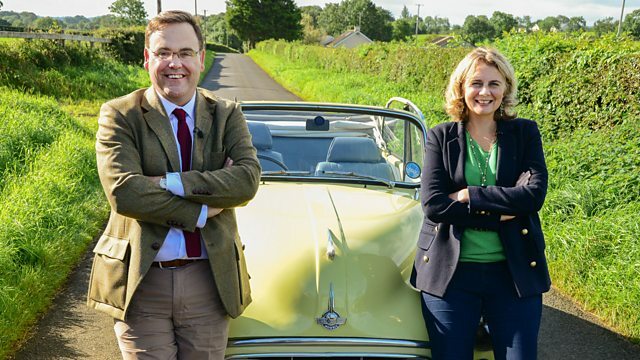 Auctioneers Paul Laidlaw and Catherine Southon are almost halfway through their road trip. Deep in the Scottish Borders, Catherine uncovers a pair of vintage glove puppets. But will they give her a helping hand at the Edinburgh auction?